We’ve written previously on how Business Rules Management Systems (BRMS) like DecisionSmart are used across the customer lifecycle. In this blog we cover some of the frequently asked questions we get asked about decisioning and DecisionSmart. DecisionSmart is a decision engine that allows business users to capture and apply business rules, matrices, scorecards, decision trees, terms of business tables and decision flows across the entire customer lifecycle. It has multiple uses and is a key component enabling businesses to automate decisioning. Can you build scorecards with DecisionSmart? No, you can deploy scorecards that have been built elsewhere. DecisionSmart enables you to execute scorecards. You need a statistical package such as SAS, R, Python, Model Builder (by FICO), etc. to build your models. Once built they can be deployed in DecisionSmart for execution purposes. What business uses does DecisionSmart have? There are countless other applications for DecisionSmart. What’s the difference between AppSmart and DecisionSmart; and which one do I need? For originations’ purposes, a lender would need to utilise a variety of systems for a variety of tasks. It’s therefore important to understand the specific roles that each system plays. 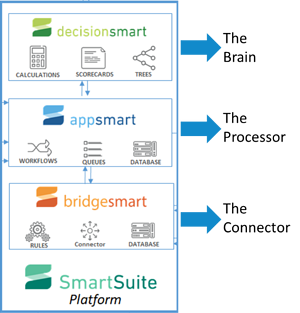 Clients wanting a comprehensive originations solution will purchase the Principa SmartSuite platform comprising of 3 systems: AppSmart, BridgeSmart and DecisionSmart. Can you capture applications in DecisionSmart? No. Applications are passed into DecisionSmart from a data capturing service (e.g. AppSmart or account processor) for scoring. Can I, the client, manage the system or will I be dependent on Principa or our IT department? DecisionSmart has been designed to give business the ability to deploy and manage their own strategies with very little IT requirement. Principa, of course, are always there to offer support when changes are required, but some of our clients manage this without Principa’s input. The initial deployment and integration is usually set up by Principa. Is there a training program for DecisionSmart? Yes, Principa have a training program which enables users to be fully trained on the system following a half-day workshop during which the user will build and deploy a credit strategy from beginning to end. Does DecisionSmart allow for both batch and single scores? How is data passed into DecisionSmart? Is DecisionSmart open to APIs? Yes, the API architecture used is SOAP. Can you access DecisionSmart through web screens? The next version of DecisionSmart (available in mid-2019) will use web screens. Is DecisionSmart available as an on premise or Cloud deployment? What security parameters does DecisionSmart utilise? Access to DecisionSmart is typically through Active Directory. Users are assigned roles and each role gives the user access to different metaphors and the ability to view, edit, add, delete or activate a new metaphor. You also have the ability to allow users access to some scorecards, but not others (same with other metaphors) thus creating Chinese walls in the system. Can you lock certain scorecards from certain users? Yes, this is done through the security settings. What sort of audit trail does DecisionSmart have? DecisionSmart features full versioning of each decision metaphor. It allows the user to track when a scorecard or strategy was used, when changes were made and who was responsible. Different versions of each metaphors are created when a user wishes to make changes. The state of each version can be “deactivated”, “design” or “active”. Only one version of a specific, e.g. scorecard, is active, however the user is able to copy an old scorecard and make adjustments. Who develops the strategies and scorecards that are deployed in DecisionSmart? 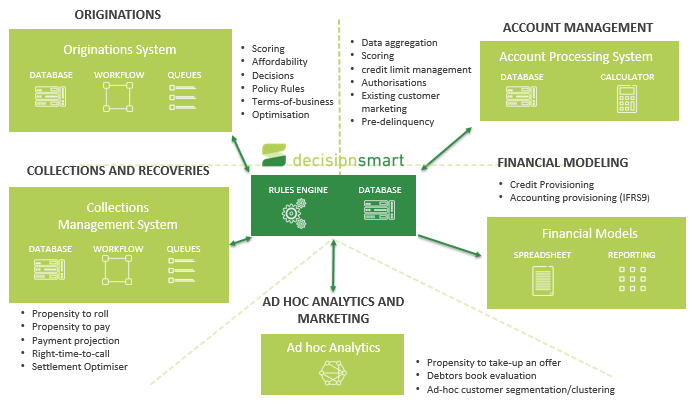 All decisioning strategy components (such as scorecards, matrices, decision trees, policy rules) can be deployed within DecisionSmart (DecisionSmart is typically sold without these components as they are all customer-specific). Occasionally the customer will build these components themselves, but Principa is frequently asked to assist our clients in creating the strategies and strategy components. Principa has a full analytics and advisory team who are able to fulfil the tasks. Is the model user interface self-explanatory and user-friendly? DecisionSmart is fully business configurable. A screenshot of the scorecard metaphor is shown alongside. Characteristics can be added from the data dictionary; attribute groups can be defined; and weights inputted/adjusted. For scorecard alignment parameterised values are given too, allowing for effective scorecard management. Other strategy components (metaphors) are similarly configurable by business. Can scorecard segmentation occur? How many levels? 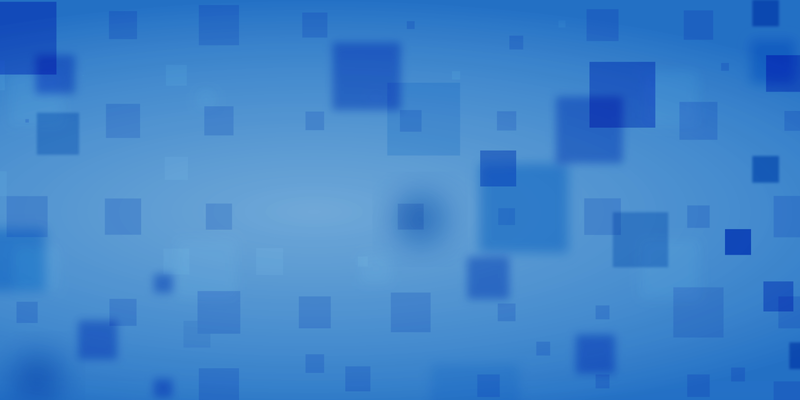 Unlimited number of levels are possible. Can you set a scorecard cut-off and risk grades? Yes, this is done through matrices, trees and terms-business-tables. See adjacent and below images. Can one calculate multiple scores for one account? Yes, DecisonSmart effectively allows for unlimited metaphors to be executed for each account. A second score can be called for a following step in the decision flow in the same way except that the mapping would be to another pre-determined score, e.g. “Custom_Bureau_Score”. Thus an unlimited number of scores is possible. These 2 scores could be used later in a decision tree or matrix, for example. Can DecisionSmart monitor a scorecard’s stability and performance? Extracting the observational data in DecisionSmart and merging it to performance from the account processing system utilising SAS, SQL, Excel. Linking performance files with observation files in MSSQL. The second option will allow the user to run automated reporting, but the initial set-up will require this to be enabled. Reports are created in Microsoft SQL Server Reporting Studio and are therefore fully configurable and customisable. Can DecisionSmart be customised to any local language requirements other than English? Whilst the screen menus and labels are currently all in English, DecisionSmart is not limited in allowing the user to configure datafields, scorecard values, table entries, etc. in different languages. 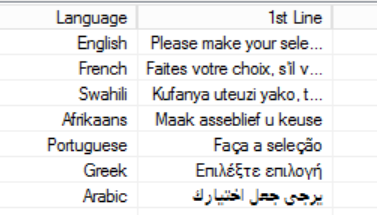 Alongside is a screenshot of USSD menu items in different languages configured in DecisionSmart. How does the system cater for scorecard alignments and fine-tunes? For non-linear alignments, the score can be converted utilising “Calculated Workfields” which caters for a number of mathematical functions utilising the “.Net portal”. If a scorecard is fine-tuned, you can edit the characteristic’s attribute groups and associate weightings within the scorecard. This will create a new version of the scorecard to ensure a sound audit trail is in place. Do I need to map my characteristic variables to numeric values? No. Within DecisionSmart you link characteristic fields to lists. The lists represent the expected values from a characteristic field. No mapping to numeric is required. 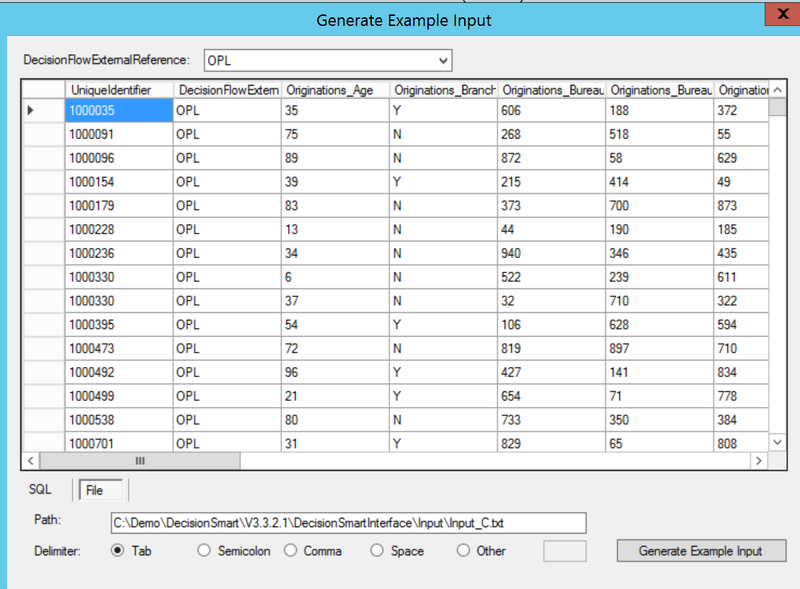 New fields can be generated from multiple inputted/calculated fields – in essence DecisionSmart can aggregate data. If data from multiple data sets (e.g. time-series data or data submitted from previous months) is required in the aggregation, it is better to run a data-staging and aggregating step before sending into DecisionSmart. Can DecisionSmart run “if statements”? Yes, this is available in the .Net portal in Calculated Workfields. Can decimal fields be used in the product? Does the system support error messaging for calculation errors, for example division by zero? Is DecisionSmart restricted in number of decision trees? Is the tool restricted in number of decision keys for the trees? As yet, no limit has been found! Can leaves of your trees be labelled both numerically and/or with descriptors? Yes, depending on the “type of leaves” – one can even have a leaf trigger a calculation. Does DecisionSmart have a policy rule module? What functions can be built into policy rules? Logical functions, data functions and mathematical functions. How are policy rules collectively managed and executed? Policy rules are collectively managed through “policy rule groups” – i.e. policy rules are grouped in groups (e.g. “Pre-bureau knock-out rules”) and then executed. Are the terms-of-business tables customisable (i.e. can you change the columns)? Completely customisable. So you can set up a collections TOB tree which might show the collections treatments, timings, tone, script, settlement discount offers etc. The originations TOB tree might simply represent Accept/Reject decision, Risk Grade, Interest Rate and maximum loan amount. These are completely customisable. Up to 20 columns can be placed in a table; if more are required another table can be called. Changes to tables is managed by business. Can the outputs of the terms-of-business table be used in a calculation (e.g. terms-of-business table giving cross-sell offer - the amount offered could then be used in the affordability calculation)? The outputs are mapped to fields in the data dictionary. These fields can then be used in a calculation. How does DecisionSmart cater for complex calculations and data transformations? DecisionSmart has a nifty calculation and transformation tool within its data dictionary. 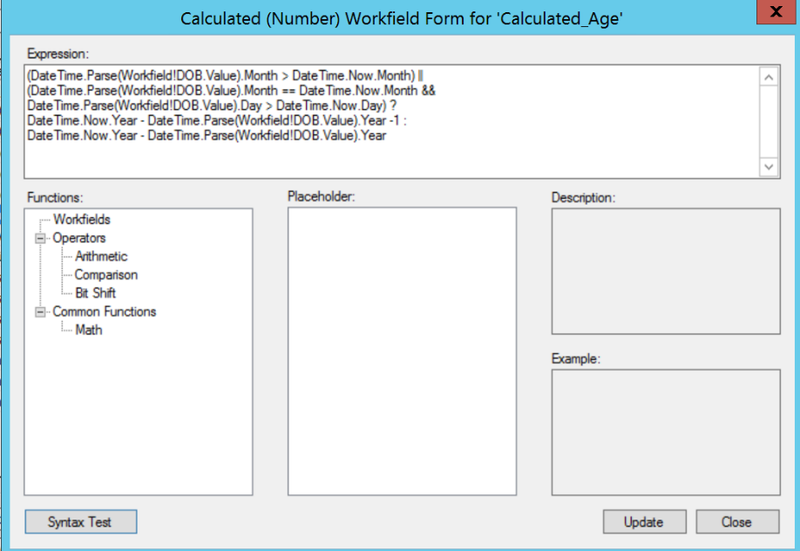 A field can be defined as numeric, characteristic or calculated workfield. 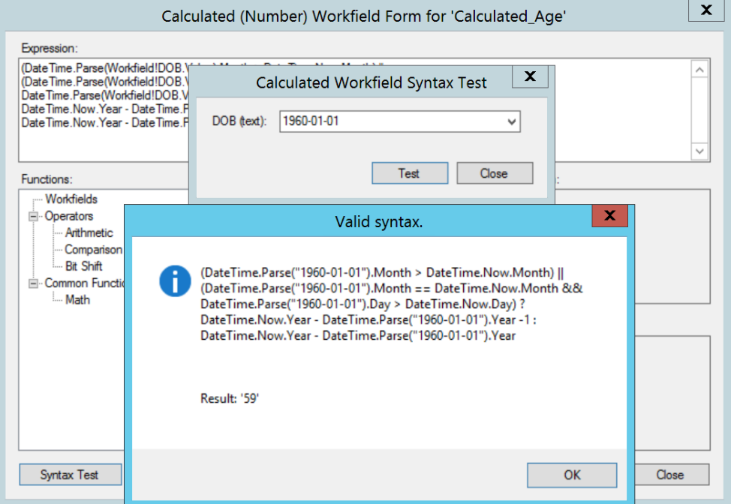 For calculated workfields, you can transform a data field utilising .Net code that can be copy and pasted by a business user. The example below allows you to convert a date of birth of format CCYY-MM-DD to an age. Once the code is written you are able to test it. How do you set up a champion-challenger test (test-and-learn) in DecisionSmart? For a champion-challenger test, the first thing that needs to occur is your population needs to be randomised. This can be done through sending a random number into DecisionSmart or DecisionSmart producing its own random number (done through calculated workfields). Once a random number is created/passed in, a population can be split with one part receiving the “champion” strategy and the other(s) receiving challenger strategies. Reports can be set up in MSSQL Server Reporting Studio to monitor the strategies. How do you combine all your decision metaphors into a flow? Once created, the decisioning metaphors can be placed into a decision flow. The decision flow instructs the system in which order to execute the decisioning metaphors. The final output structure is given at the bottom of the screen. What type of scorecards can be deployed within DecisionSmart? 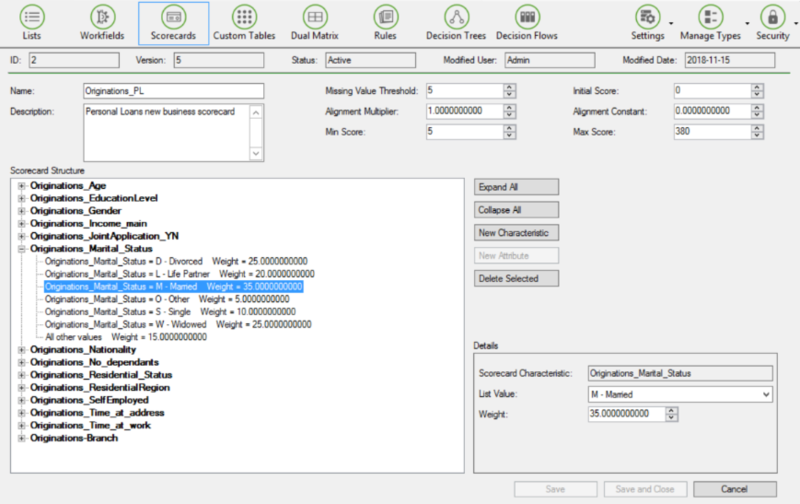 The main DecisionSmart scoring metaphor caters for additive scorecards. These are standard scorecards that could have been built using expert methods, regression methods, mathematical programming methods, etc.. Whilst the scoring module is set up for this, other models can also be catered for utilising a combination of calculations, trees, and scorecards. For more exotic models, DecisionSmart has the ability to call stored-procedures that can, for example, execute an “R” model or Python model. Does DecisionSmart cater for machine learning? DecisionSmart does not enable you to programme machine-learning models. You can however deploy models that have been built utilising machine learning methods. Alternatively you can call another decision service or a stored procedure in R/Python to execute the model(s). Does DecisionSmart allow you to test your models? Yes, DecisionSmart has a useful feature that allows you to generate test cases for a particular decision flow. Here every combination of input file is compiled into a test file. This file can then be run through the system in batch mode and the results compared when run through Excel, SAS, R, Python, SQL etc. The test file generated takes every combination of list field and random ranges of numeric fields thus ensuring every test case is managed. What process is followed when changes are required in DecisionSmart? DecisionSmart allows for various change testing protocols. A popular approach is detailed below. Requisite testing is run through sending files through the old strategy and new in DecisionSmart_Test and/or running the data through the same strategy coded in SAS. The results are then compared. What database does DecisionSmart utilise? DecisionSmart is deployed on MSSQL 2016. Currently it cannot be deployed on Oracle or other databases, however DecisionSmart can call other databases through API. What are the deployment requirements for the current version of DecisionSmart? 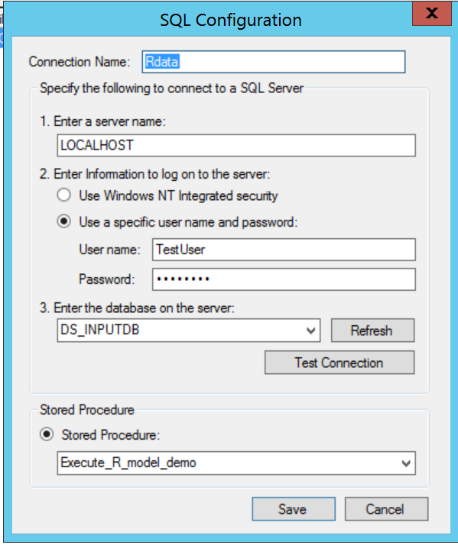 The SmartSuite will need to be deployed on a IIS server (Microsoft 2012 r2 or above) supporting MS SQL 2016. The application and database server recommended specs are: 2GHz 64-bit processor, 32GB memory with 200GB of disk space (500GB for database server). How does Principa support its products? Principa has a 24/7/365 help-desk to support our clients across Africa and the Middle East on our products. Support is from Cape Town and Johannesburg, South Africa, but most support issues are resolved remotely. How frequent are software releases and is the adoption therewith mandatory? New software releases occur quarterly and are not mandatory. How many scores can the system calculate an hour? This all depends on server size, size of file and complexity of scorecard, but we have been able to calculate ~30 million scores in an hour. Thomas Maydon is the Head of Credit Solutions at Principa. 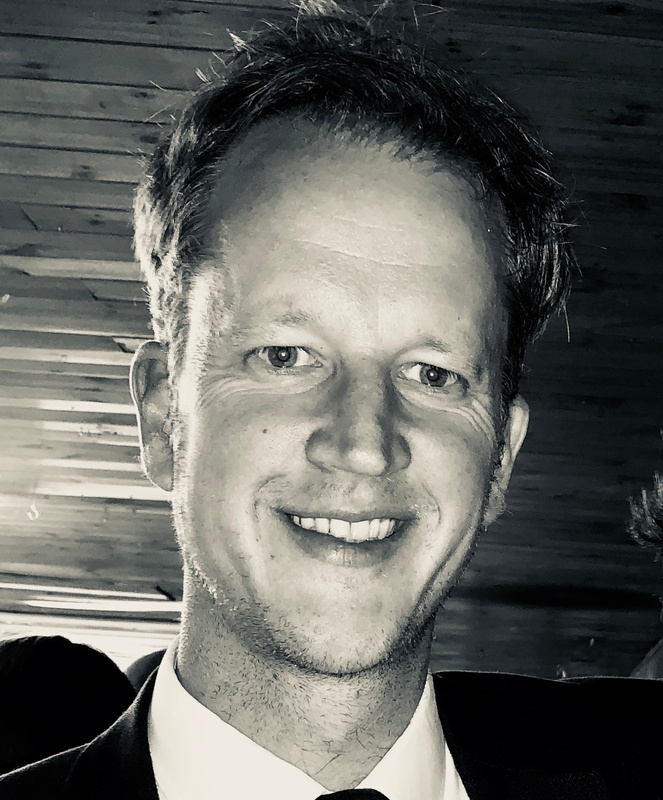 With over 13 years of experience in the Southern African, West African and Middle Eastern retail credit markets, Tom has primarily been involved in consulting, analytics, credit bureau and predictive modelling services. He has experience in all aspects of the credit life cycle (in multiple industries) including intelligent prospecting, originations, strategy simulation, affordability analysis, behavioural modelling, pricing analysis, collections processes, and provisions (including Basel II) and profitability calculations.